While the mesmerising waterfalls are the primary reason so many people plan a holiday to Niagara Falls, there are a number of other things you must experience while visiting the region. From beautiful gardens and parks to a variety of museums, wineries, and plenty of family friendly activities, there is a wealth of things to see and do in Niagara. If you are planning a holiday to Niagara Falls any time soon, make certain you take the time to visit the following places. Spread over more than 400 acres, the State Park offers spectacular views of the Falls, gorgeous gardens, miles of hiking trails, fascinating historical sites, and plenty of shopping and dining options. In fact, the State Park has so much to do that you should plan on spending more than one day here. Be sure to take the Maid of the Mist Boat Tour, as well as take part in the Cave of the Winds tour for amazing up close looks at the Falls. More than 2,000 butterflies from 50 species call this conservatory home. Designed with a rainforest setting, there are an array of exotic plants, as well as a pond and waterfall situated over several levels. You can see butterflies emerging from their cocoons while others fly freely throughout the conservatory. Take your time on this self-guided tour to make certain you see everything. Home to more than 400 species of tropical birds that fly around freely, Bird Kingdom is currently the world’s largest indoor aviary. You can get up close and personal with the birds as they eat, play, fly, and bathe. For even more fun, stop at the Reptile Encounter Zone for an intimate look at tortoises, geckos, snakes, lizards, and more. Perfect for the entire family, Marineland gives you the opportunity to feed the friendly white whales, as well as view dolphins, walruses, Beluga whales, killer whales, and more marine animals. Afterwards, take in an exciting show before heading over to feed the deer, bison, and elk. End your trip with a huge shot of adrenaline as you take a ride on the Sky Screamer that takes up over 137.2 metres in the air. Head 236 metres above Niagara Falls to see spectacular views from the tower’s observation deck. Stay for an upscale dinner at the Revolving Dining Room Restaurant or take the family to the Summit Suite Buffet. Stop by the 3D/ 4D movie “Legends of Niagara Falls” to get a look at how the Falls were formed. Finally, be sure to visit the Family Fun Centre for games and rides before purchasing a few souvenirs at the shops offering everything from international brands to handicrafts. Sprawled out over 2.5 million square feet, the casino has more than 150 gaming tables and 3,000 slot machines. In the heart of the casino, the Splash Bar features live music and they have had famous entertainers including Al Green, Tony Bennett, and Ringo Starr grace their stage over the years. 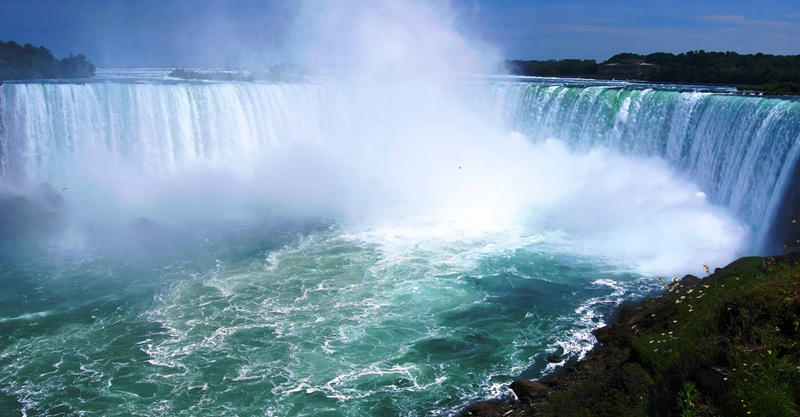 There is no shortage of fun activities to take part in while visiting Niagara Falls. After a long day exploring everything the area has to offer, you’ll be more than ready to head back to your hotel for a great night’s sleep.